On March 4, I completely cut out all grains --although I just started with wheat, initially. I eat loads of veggies, as well as lean meats, cheese, plain Greek yogurt, berries, nuts, and seeds. Sometimes, I have a banana if it is made into a treat like the one below. No added sugars in anything. I also have Emerald Essentials Action Whey mixed into a smoothie (you can use any brand). I do not eat any grains. I drink water, unsweetened sunflower seed milk, unsweetened chocolate almond milk, unsweetened ice tea, and coffee (which I have managed to cut down on). On weekends if we're hanging out with neighbors, I will have the occasional Michelob Ultra 55 (2 carbs) or a drink with the yummy (no carbs/sugar) iced cake vodka. That, in a nutshell, is how I have lost more than 20 pounds and have dropped two sizes. A couple weeks back, we took the kids for ice cream. Ah, ice cream. It was hot and I was in the mood for some chocolate almond custard. Knowing how sugar makes me feel, I didn't give into temptation. Why? 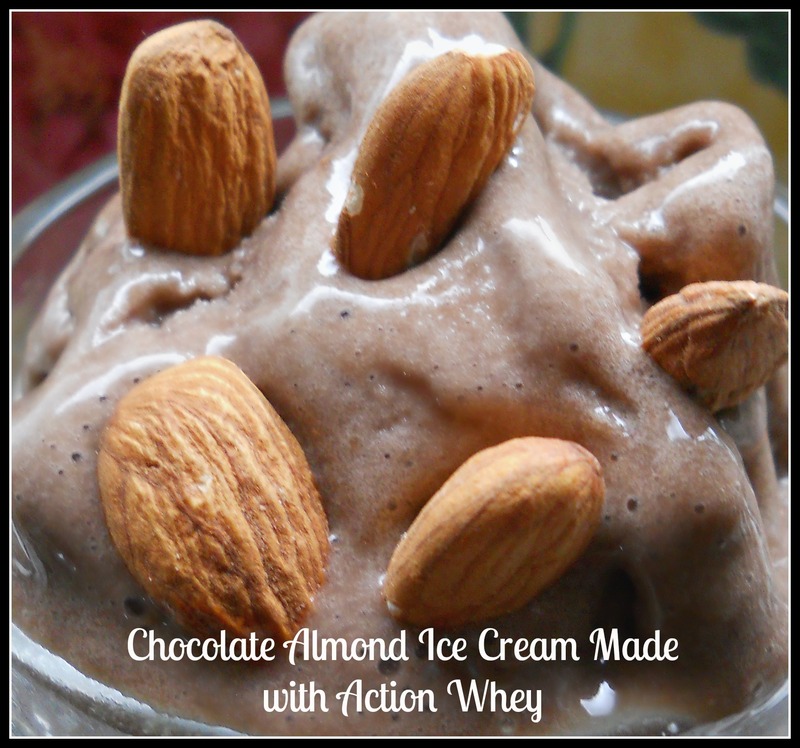 Because I had been tinkering around in the kitchen and created a delicious chocolate almond frozen treat with my whey protein powder. Do you have an ice cream maker? Any type will do. Mine is a little one that was less than $30. It works well and makes a yummy treat in less than 30 minutes. My husband and my boys went to the local frozen yogurt place where you add a bunch of toppings and pay per pound. While they were gone, I whipped this up for myself. This recipe yields 1 serving–you can certainly alter it to make more. *Warm the almond milk and cocoa powder either in the microwave for 40 seconds or on the stove over low heat. Stir. Put sliced banana and whey protein powder in a blender and pour the almond milk/cocoa mix. Blend. Pour into your ice cream maker and churn until ready. My ice cream was done in less than 20 minutes! I topped with almonds. I felt no need to add any type of sweetener. The banana and whey protein provided plenty of natural sweetness. If you feel you need more, go ahead and add a bit of raw honey or natural sweetener of your choice, but I do not think it is needed. This “ice cream” is creamy and chocolate-y and just plain delicious!